Freedom Beach is one of the most beautiful beaches in Phuket, with soft white sand and crystal clear water that is surrounded by lush green mountains. A short longtail boat ride from Patong will see you on this popular private beach for some of the best snorkeling in Phuket. The beach is cordoned off into sections, the middle is were the longtail boats come ashore to drop beach goers off and to pick them up. The southern end of Freedom is one of the best locations in Phuket for snorkeling, here you will find lots of spectacular coloured fish swimming close to the shore, unfortunately most of the coral around Freedom has died. We found the northern end of the cove was the best area of the beach to go swimming. Freedom is a secluded beach where you can go to completely unwind, unlike the major tourist beaches in Phuket you won't find any motorised water-activities. Jet skis are not welcome at Freedom and you won't be bothered by vendors trying to sell their goods. 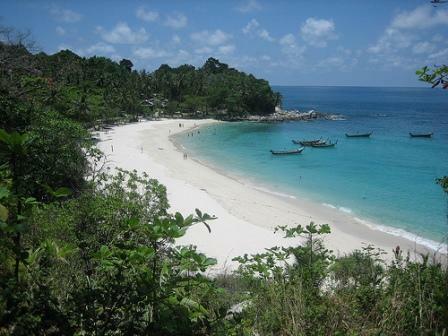 To enjoy this stunning beach you will have to pay an entrance fee of 200 Baht per person. 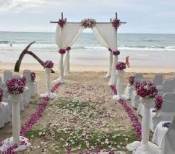 There are sunbeds set further back under the shade of the palm trees that you can hire for around 140 baht per chair. We recommend this beach as an ideal location were the whole family can enjoy a fun day on the beach swimming and snorkeling. You will also find a volleyball net and a set of football goals along the beachfront. There is a small restaurant located at the southern end of the beach, serving a selection of Thai food. The meals might be slightly more expensive, however the food is extremely good. Showers and toilets are available on Freedom Beach. You can hire snorkelling gear at the restaurant and if you forget to bring a towel you can hire one for 200 baht. This is definitely one of the cleanest beaches we have visited in Phuket. There is no accommodation available directly on the beachfront at Freedom. However there are a couple of resorts located close by that you may like to have a look at. 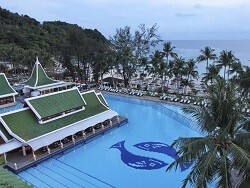 Marriott Merlin Beach Resort is located on the beachfront at Tri Trang. Nowadays you can also catch a tuk tuk, the tuk tuk won't take you to the beach but they will drop you off near a steep track that leads down to the beach. Just be warned the trek down is one thing but the hike back is worse. The easiest and probably the safest way to get to Freedom is to hire a longtail boat. Boat are available from the southern end of Patong, just near the pier. Depending on the number of people expect to pay around 1,200 to 1,500 baht per boat for the return journey. The longtail boat ride from Patong to Freedom will take around 15 minutes, your journey will take you past a couple of other beautiful beaches such as Tri Tra, Paradise and Tri Trang beaches. 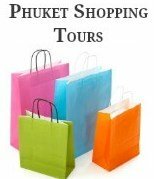 You can also hire longtail boats from Tri Trang to Freedom which will cost around 500 baht.